I love personalized & customized gifts, housewares, clothing for the kids, etc! I think adding your personal touch to an item, just makes it that more unique! I was recently introduced to Create-UR-Plate & after browsing their site, I knew these would be plates my entire family enjoyed as well as my guests! With Create-UR-Plate you can create your own custom plates with just a few clicks on the computer! You can browse the Plate-Able library online at Create-UR-Plate, then choose your favorite design-they have a ton from baby showers, to graduations, holiday's & more! It's so easy to customize your Plate-Able, simply choose your design & then add in your own photo's & or text, once your happy with your overall design, just add it to your cart! Now that you've created your Plate-Able, it's time to choose your plate size, (these are sold separately) they offer dinner & salad size glass plates, as well as disposable dinner & salad plates! The great thing about Plate-Able's is they are priced at just $1.99! You can create & order one for holiday's, parties, family gatherings & more! Not to mention these would make a pretty neat gift! The glass & disposable plates range from $7.50 to $29.99 depending on the size & option you choose. When your package arrives, your Plate-Ables will each be on their own paper, you will need to apply them to the underside of your glass plates but don't worry, they go on with a breeze! It's easy to wash your plates too, just peel off your Plate-Able, stick it back on the paper, wash your plate, then when it's dry, re-apply your Plate-Able or grab a new one for an upcoming holiday, birthday or other special event! Create-UR-Plate is such a genius idea, seriously, I absolutely love my new plates & within seconds after opening my package, I created beautiful plates & I can't wait to show them off! The plates turned out amazing, we've never had dinner plates like this before, so I'm very excited! I saved the 4th birthday one of my daughter for a surprise for her party in October. I think it will be the talk of the party for her to have her very own customized plate! So what do you think? What designs would you put on your very own Plate-Ables? Buy it: Purchase your own plates & customize your own Plate-Ables online at Create-UR-Plate! 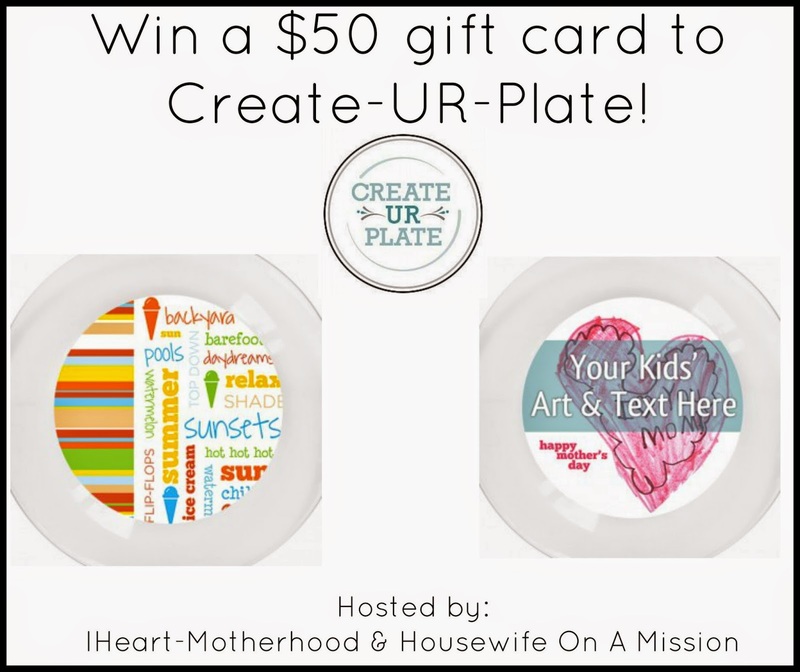 Win it: One lucky reader will win a $50 gift card to Create-UR-Plate! I like the Cheetah Print - blue Plate-Able™ and the Summer Fun Stripe - tangerine Plate-Able™. Thanks. My favorite are the monograms and The baby owl plates designs. The Birthday Cupcake - white Plate-Able is my favorite design. My daughter is turning 1 in November, i'd love a personalized plate for her. Thanks for the opportunity! I have to say, I love love love the kids art ones! The Art 4 Kids Plate-able, both with and without the text. Super adorable! These are cute, I would want some of the holiday ones, like St Patricks - (Irish you plateable) Thanksgiving (Keep Gobbling) and Christmas (Jingle Bells in Red,) these are very cute idea. It is very hard chose only one.I really like the Cocktail Conversations - Crazy Plate-Able™ for my bff. There are so many cute ones! I really like the Birthday collection, where you can personalize it with whoevers name and picture! It is such a cute and fun idea!